Transitional design is the term that describes a chic and fashionable blend of traditional materials and modern shapes. The occasional table is a fabulous example of transitional design that's stylish, yet comfortable enough to work in the ordinary home. 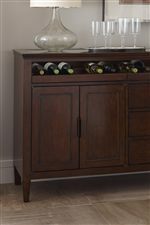 This handsome piece features solid wood construction, with maple hardwoods specifically selected for their versatility and beauty. 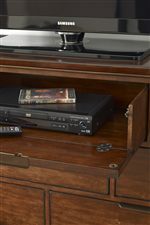 Adding lustrous color to the maple frame is a rich, Amaretto wood finish and low-profile, copper colored drawer pulls. Table offers abundant opportunities for decorative display with its open case top and bottom shelf. 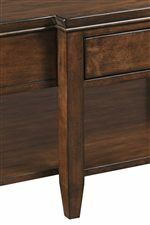 The Elise Transitional Elise End Table with One Drawer by Kincaid Furniture at Turk Furniture in the Joliet, La Salle, Kankakee, Plainfield, Bourbonnais, Ottawa, Danville, Bradley, Shorewood area. Product availability may vary. Contact us for the most current availability on this product. The Elise collection is a great option if you are looking for Transitional furniture in the Joliet, La Salle, Kankakee, Plainfield, Bourbonnais, Ottawa, Danville, Bradley, Shorewood area. 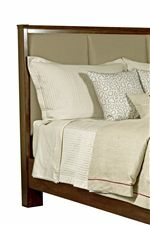 Browse other items in the Elise collection from Turk Furniture in the Joliet, La Salle, Kankakee, Plainfield, Bourbonnais, Ottawa, Danville, Bradley, Shorewood area.